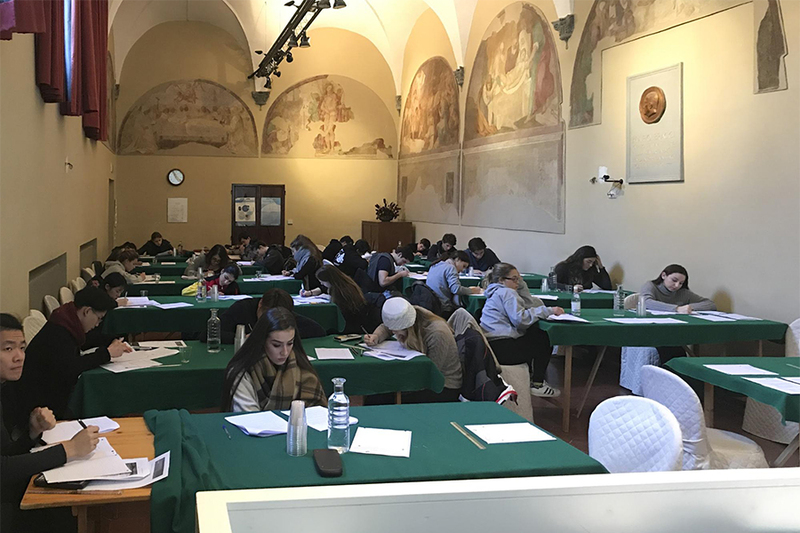 All seniors in the second year of the International Baccalaureate Diploma Program spent their Spring Academic Travel preparing for their impending exams at a historic monastery in Siena, Italy. The IB Seminar trip, which was first envisioned and organized by IB Coordinator Mr. Howard Stickley in 2017, focuses primarily on mock exams, review sessions run by IB teachers, and group study sessions. In the article below, Amelia Panella ’18 shares her impressions of this year’s trip. It was a tough week filled with study, but it helped my fellow IB students and me prepare for the long-awaited exams in May in a way I would have struggled to do on my own. 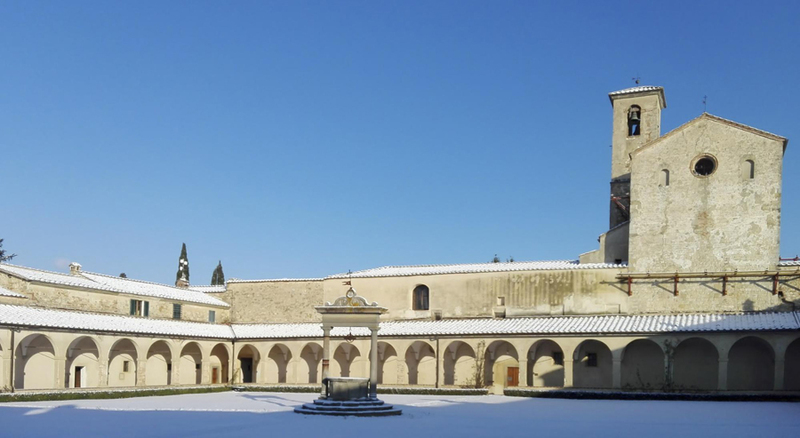 All the IB students left on a Sunday morning in late February for a six-hour bus ride down to Certosa di Pontignano, a beautiful old monastery close to the city of Siena. Upon arrival we were greeted with a delicious Italian lunch and had some time to relax—and then it was straight onto reviewing for our first exams the following morning. The exams were structured just as they will be in May to show us what to expect and give us a better idea of what level we are at in each course. When we weren’t taking exams, we had independent review sessions or even specific subject review sessions with our teachers. My initial reaction to being told we would be spending the whole week studying was definitely not one of excitement, but once I got there I found myself using every single review session to get as much out of the trip as possible. It was also a much-needed opportunity to finish IAs, prepare for exams, and catch up on other work. Though to be fair, it wasn’t all work. A couple evenings of the week we took trips into the city to explore and take a break from our exams. 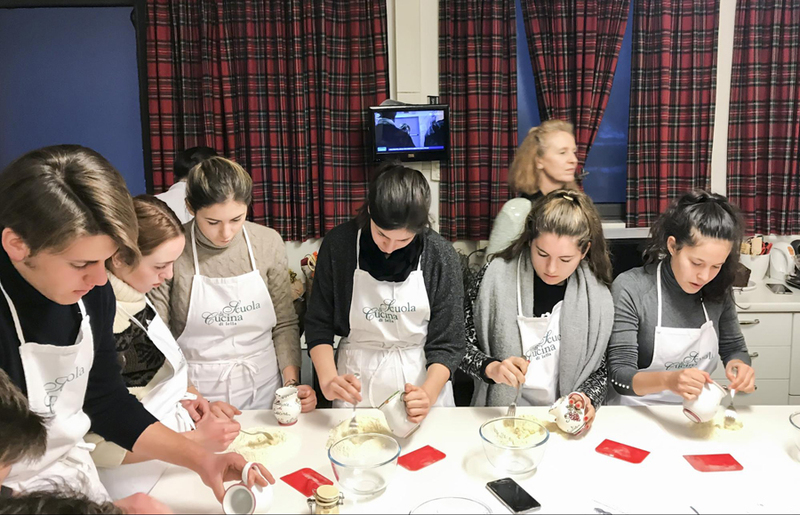 One night, we went to a Tuscan cooking course where we made bruschettas, crostini, and a pasta dish from scratch, followed by a delicious panna cotta for dessert. On another evening we visited the Palazzo Pubblico in the central piazza to see the frescoes. 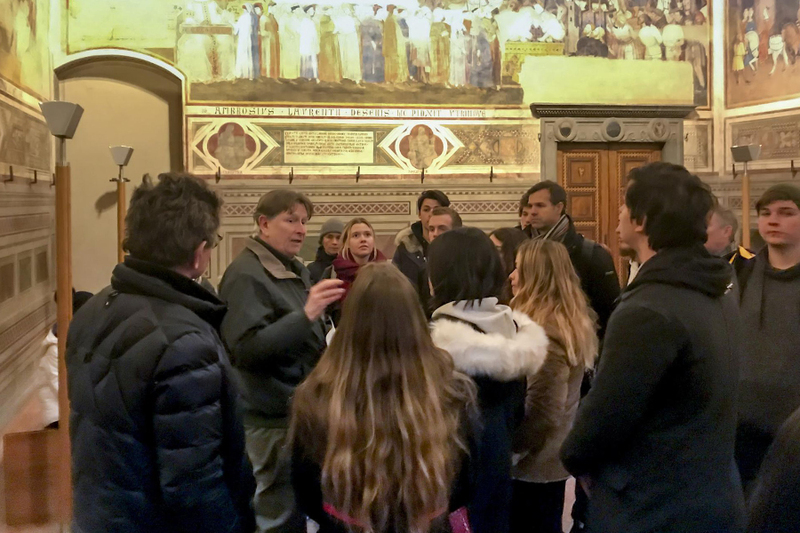 Mr. Aeschliman, our Art History teacher, gave us a great tour of all the frescoes, some of which we had even studied in class earlier in the year. We were then allowed to go and explore the city on our own and roam through the alleyways. Siena was full of places to discover, and the streets were filled with cafes and restaurants and the chatter of the locals sharing their afternoon coffee. It was a tough week filled with study, but it helped my fellow IB students and me prepare for the long-awaited exams in May in a way I would have struggled to do on my own. It also gave me a better understanding of what point I’m at in each of my courses and made me feel much more prepared for this final stretch. See more photos from the trip to Siena.